About 45 minutes away by boat from the port of Surigao City is a group of islands featuring the best that nature has to offer. The Dinagat Islands were formerly part of Surigao del Norte but become a separate province in 2006. While it is known as being the home to the Ecleo family (Ruben Ecleo Sr founded the non-profit organization Philippine Benevolent Missionaries Association) – who have a castle-like residence on the island – there’s a lot more in store for visitors to the island. This is where all forays around the islands begin. As you approach the town, you will be greeted by several islets and rock formations – a truly breathtaking experience. As you near the San Jose port, you’ll notice a castle-like structure from the top of a hill. This is the home of the Ecleo family, the most prominent clan on the islands. Also located near their residence is the PBMA Shrine, the resting place of Mr Ecleo. A town 30 minutes away from San Jose, Basilisa is one of the places you can head to for spectacular sunsets. The beaches here are equally stunning, especially those located on Lalaking Bukid, an island whose name in the local language means “male mountain.” Two of the most popular beaches are Bitaog and Kabakongan. Also in Basilisa is one of the cleanest lakes in the Philippines, Bababu Lake. Not only is the lake fresh and clean, it’s also home to magnificent rock formations. And in 2013, an underwater cave was found that connected the lake to the open sea. Located north of Basilisa is a place that can only be best described as a rival for the affections of Caramoan, Coron, El Nido and Gigantes. It’s not hard to fall in love with a place dotted with several limestone islands on a bed of turquoise waters. 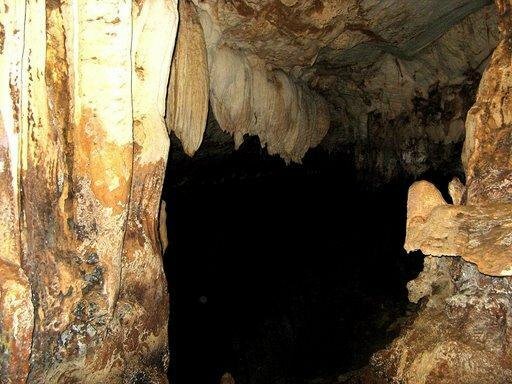 Another attraction in the area is Quano Cave which is filled with different limestone formations. The cave is connected to the Punta Villa beach and is massive and mysterious. Sunsets are beautiful from this part of Dinagat as well. One of the best places for this is at Barangay Albor. As of this writing, there are no direct flights to the island. The best way to reach Dinagat is to travel via Manila or Cebu. There are flights from both cities tko Surigao. From there, make your way to the city’s port and get on a boat to San Jose, the main town of the Dinagat Islands. If you prefer travel by sea, there are boats that ply the Surigao route from Cebu. There’s a mysterious charm to the Dinagat Islands and it’s exactly what drags people back to the islands over and over. It’s clearly an enchanting place that hasn’t been spoiled by extreme commercialization. A visit here shows you that there is beauty in mystery and that the simple life is a good one.